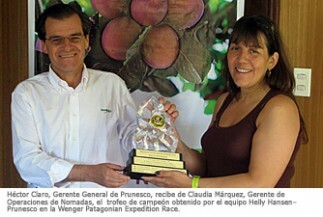 The Helly-Hansen Prunesco team, sponsored by Prunesco, leading producer of dehydrated prunes in Chile and with a history of almost 70 years, became the first team to retain the title of the Wenger Patagonian Expedition Race. The four members of the Helly Hansen-Prunesco Team took less than seven days to complete the race that is considered as the world’s toughest adventure race. The route covered nearly 600 miles of trekking, kayaking and mountain biking on the plains of Tierra del Fuego, Karukinka Reserve, Cordillera Darwin and the Beagle Channel. Last year, only 30 percent of the teams managed to reach the goal, largely due to unpredictable weather in this part of the world. This year, however, conditions were not as severe and all were able to complete the first part, from the beaches of Tierra del Fuego and up to the foothills of the Cordillera Darwin. At first the competition was virtually disputed every minute by Helly Hansen-Prunesco, the Spanish Air Europa Bimont and the Canadians from Untamed New England. However, the winners managed to get away in the mountain bike stage and became virtually unattainable in the trekking. Finally, they completed nearly 600 miles of route after rowing through the Beagle Channel and climbing Mt Scott King, almost one and a half days ahead of their closest rivals, the Spanish Air Europa Bimont.